Let me explain. The Ancient Egyptians believed that cats could store light in their eyes to use later in the dark. Though they weren’t right on the science, they had the right idea. Cat retinas actually work like mirrors to concentrate small amounts of light to help them navigate dark places. And that is exactly what the White Cat Oracle cards can do for you: help you find your way through the darkness. 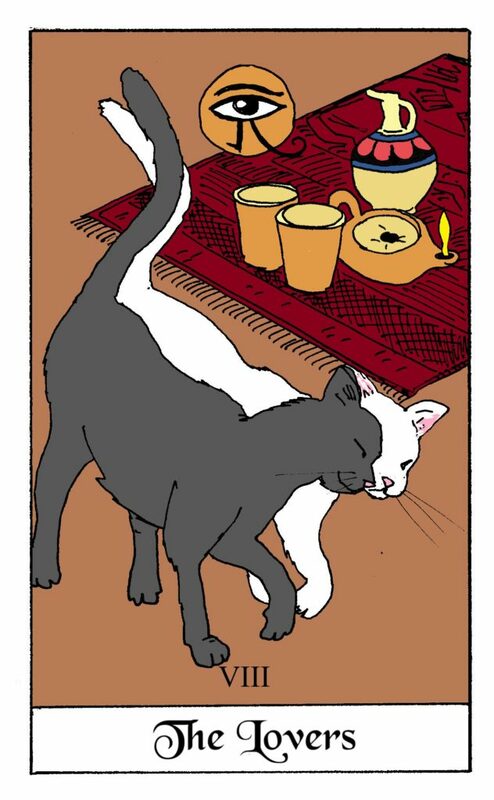 The NEW White Cat Oracle Deck I’ve designed is almost ready to go out into the world… I just need your help. I need help to raise the funds necessary to do a first printing of the cards. I’ve set up a Kickstarter, which allows you to pre-order a deck (or decks) and receive some cool rewards (in addition to the satisfaction of being an investor in this project). What do you dream of? Happiness, Health, Love, a life free of fear? Please spread the word. Forward this email. Tell all your friends. Post your support on Facebook, Instagram, Twitter… anywhere. I have 30 days to hit may “all or nothing.” Target. That’s right. Under the Kickstarter rules, if I don’t hit my funding goal, the project does NOT get funded. You always knew cats were magical—well, your proof is in the deck. Gain clarity in your life, visit the White Cat Oracle Kickstarter today!